Here's another Toys Я Us Minimates exclusive - and unless I suddenly get into the Dark Tower or Predators Minimates, then it's most likely the last one I get there. Once you've already made normal Beetlejuice, what's left to do? Him in his ugly red tuxedo! The Minimate's jacket is not the same piece the other was wearing, because this one needs to hang open so it can show off his straining vest and the frilly, ruffled shirt he's wearing beneath. Those elements are just painted on the standard Minimate torso block, but they're done cleanly - he even has the little polka dots on his bow tie! Although the mouth is the same shape as on the standard figure, the eyes are different - he's got his brows raised, rather than knit, so he looks happier and more innocent. Of course, you can swap the heads if you so choose. An old friend of Delia Deetz, Otho has held many jobs, including actor, hair stylist, interior decorator, and a paranormal researcher. His spell summons and binds the Maitlands. 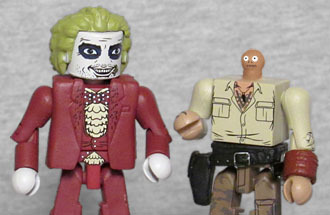 Boy, of all the Beetlejuice characters to include in this set, Otho? A plethora of interesting ghosts (Miss Argentina, the Magician's Assistant, the Witch Doctor, etc. ), Lydia in her wedding dress (which would have made tons of sense paired with this BJ)... and yet instead, Otho. A plain white guy in a plain black suit. 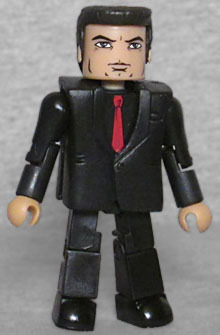 He has his red tie painted on, and comes with an alternate "scared" head - or technically, an alternate "calm" head, since he ships with the scared one on, and that's even what the art on the side of the packaging shows. Either way, it's a piece that doesn't really make any sense, since they would have had to include an entire second body in order to show him in his blue polyester suit. And if we're being honest, this figure is too thin to accurately portray Otho; it might have been better to use some larger molds and just give them painted costume details. Heck, the hairstyle is even close enough! We don't know if there will be more Beetlejuice Minimates, but we can hope; there are just so many possible things that would work as Minimates! Adam and Barbara in their wedding clothes, with alternate "withered" faces. An alternate head with zipper or metal plate for Barbara. The Deetzes. School uniform Lydia. Spiky Beetlejuice. A Sandworm (part of one, at least). Juno. The diver with the shark. The smoking man. A football player, using Plants vs. Zombies parts. Just think, they could make the man with the shrunken head just by leaving the standard Minimate balljoint exposed and painting eensy little eyes on it! There's definitely enough material for a second (and maybe even a third) series of figures, but is there enough interest? 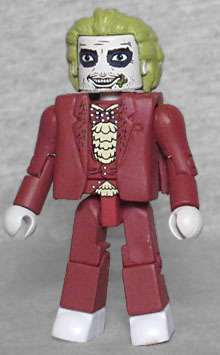 This entry was posted in Art Asylum, customs, MMMR and tagged Beetlejuice, Minimates. Bookmark the permalink. Beetlejuice is on TV right now. Spiky Beetlejuice could come with one of the demonic strippers!